I had the privilege of attending a friend’s one man show last week. It was entitled “Stages: the Defining Phases of One Man’s Life.” Mr. Hester was incredible. He took us on his personal journey with humour, grace and song. I couldn’t have done it. It was tightly edited, performed and paced. Especially for a “vanity project.” “American Idol” fan? Head for your local theatre instead and support the people who can’t give up their day jobs, but will turn themselves inside out on stage for your viewing pleasure. If you are very lucky, you may catch Chris Hester’s next performance. I took something else away from that evening. Watching Mr. Hester’s “costume changes” I was struck by how effective a single article of clothing can be in conveying a message (and the pleasures and dangers that can come with that territory.) With the backwards baseball cap placed squarely on his head, Mr. Hester immediately let us know that he was about to relate a few college experiences to us. Take the conversation piece of a tie (above) that I wore to the performance. It is a Brooks Brothers tie ca. 1990’ish. I used to wear it only with charcoal grey suits and white shirts, trying to channel John Malkovich’s opening scene in “Object of Beauty.” Now it stands out (hopefully in a not-too-clownish fashion) as a fun part of a whimsical whole (at least that’s what I hoped for.) A “yes I’m ‘dressed up’ but I’m still willing to have fun” sort of thing. I think that for a casual Friday, evening at a live performance or cocktail party it would be a good look. Let’s deconstruct for a moment, the evening’s look. Sober, three button, navy chalkstripe suit. Red, white and blue, tattersall check shirt. Red and blue pocket square. That’s six patterns worn together in a more-or-less harmonious whole thanks to varying scales of the designs. But it was the tie that got the most comments. Why? Because the large spots are inherently un-business like. So, evolve your everyday look by repurposing pieces that haven’t seen the outside of the closet for awhile. But, be very mindful of the message that you’re sending. Some days it’s important to project thoughtful, sincere, confident. On others… feel free to send in the clowns, and show them that you don’t take everything as seriously as they think. 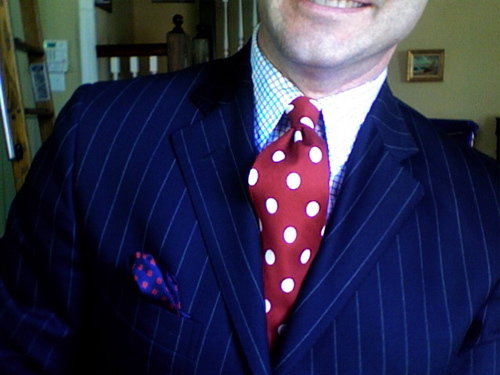 This entry was posted in Elegantology and tagged clothing, Elegantology, Entertaining. Bookmark the permalink. I was engaged wearing a navy ground polka dot (oversize – like your tie) dress with sling backs and I remember feeling so giddy, so in love! polka dots are one of my favorites, classic, yet fun! No man has ever been able to resist a woman in a blue and white polka dot ensemble. Even gay men will take note. It’s a fact. Hello HOBAC, how curious and absolutely true. Speaking from my side of the aisle, it’s one of my favourite combinations. Blue and white polka dotted sleeveless shift, belted, wide brim white straw hat…. you just can’t go wrong.